The specification of furniture in public venues should be that it is fully compliant with HSE guidelines and that it is fire retardant, robust and above all safe for public use. However, some venues do hold furniture which does not meet these guidelines. At Hill Cross we don’t promote or sell furniture which is not contract grade. Here we offer some guidance to our customers on how and why to select the right fabric to ensure that the furniture in any public venue is safe and complaint. Hopefully this guide will act as a useful point of reference to assist in making the correct decisions when choosing both your fabric to ensure you are purchasing the correct product. Within the contract market fabric used upon furniture must reach a higher flame retardant ignition than is required for the domestic market, in plain terms, they must not ignite or smoulder to enable evacuation of larger numbers of clients, this is called a Crib 5 or Source 5 certification to BS 5852:2006 as it is based upon the fabric being placed upon a wooden structure, hence the word Crib, and is required by law in all public and commercial premises. All fabric as well as the foam underneath the covering, must reach this British Standard, it is no good having a pretty fabric that meets Crib 5 but inferior foam underneath that would smoulder and emit lethal gases. 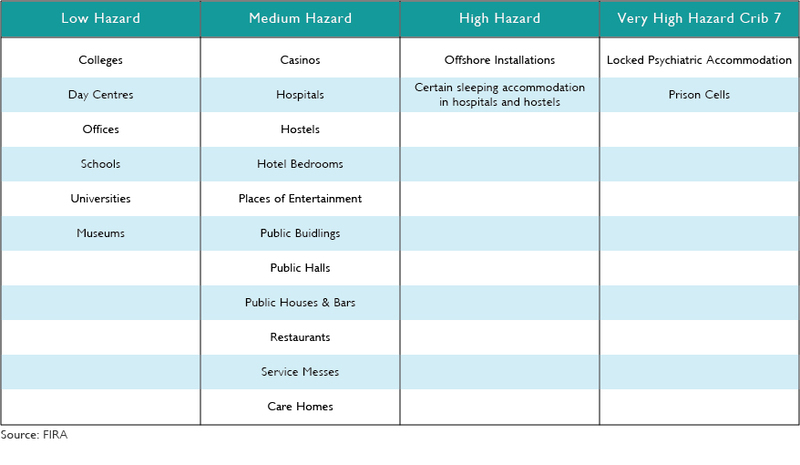 As a standard these are some of the classifications that are required by law to have all fabric and foam products meeting the Crib 5 classification as referenced by FIRA, they hold three hazard levels for Crib 5 treatment and one for Crib 7 and we would refer you to the BCFA/FIRA leaflet for a comprehensive guide to all legal requirements. As the specifier of the fabric, you are the person who selects the actual fabric, to suit the mood and ambience of the location, often this is your own preference or designer lead, and they are referred to as “The Responsible Person or The Competent Person.” It is their job to ensure that contract grade Crib 5 fabric is selected for all furnishing and to be able to provide any certification that may be required. The suppliers responsibilities are quite simple, they must inform you if the fabric that has been specified does not meet Crib 5 or is unsuitable to be treated to Crib 5. Then alternatives can be offered for the chosen fabric with correct certification or advise on a suitable Crib 5 barrier interliner that will protect the interior to a Crib 5 standard. All fabric companies display on their fabric books the Fire Rating of every fabric. The one you choose must carry the Crib 5 logo which is sometimes a simple “5” combined with a symbol of a flame and a cigarette, or even the test standard BS7176 Crib 5. Now, just to confuse things slightly, there are exceptions, a chosen fabric that is already treated to Domestic Cigarette and Match may be able to be expertly treated by a fabric treatment house to the higher certification of BS7176 Crib 5, not all fabric’s can be treated, but many can and a allowance has to be made for any shrinkage. The treatment house, after the coating has been applied, is then able to provide certification stating that the fabric now meets the flammability test required for contract furniture. Euroflam have a great guide on this treatment process. Hill Cross strives to make things simpler for our clients and with our wealth of knowledge of fabric’s and treatments we look forward to helping you choose the correct fabric for your project vision, but don’t take our word for it, put us to the test and contact us.